Whether your product is cosmetic, perfume, wine, gourmet food or another luxury brand, it’s vital to get it right when it comes to the label. The perfect product label can set you apart from the competition. While some high-end brands are able to secure a strategic location or specially crafted displays, competition still exists. A creative and personalised label design is a must to win a customers’ attention. The LX910e Color Label Printer from US manufacturer Primera Technology, Inc. makes it possible to produce best quality labels by printing with dye or pigment ink all in the same printer by simply changing out an ink cartridge. Choose dye ink for brilliant, eye-catching prime labels or pigment ink for highly water and UV light resistant labels. LX910e utilises one tri-colour ink cartridge with an integrated print head. With every cartridge change, users get a new print head, simplifying maintenance and lowering operating costs. Process black is dark and crisp and uses no more ink than a separate black ink tank would need. The use of metallic foil is an easy way to give your product a luxurious touch and to get noticed. The label itself appears precious and emphasises the quality and value of each product. 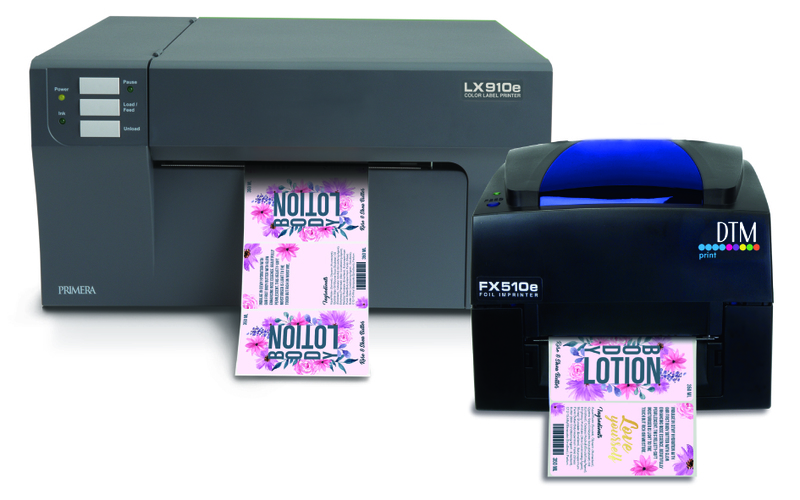 DTM FX510e Foil Imprinter is the perfect accessory to any inkjet or laser label printer. It highlights blank or already pre-printed labels by adding gold, silver, metallic red or blue design elements like borders, graphics and fonts. With an also available clear laminating foil partial glossy add-ons, comparable with an UV coating, can be applied to the product labels. The choice of the prefect label material is as well an important aspect to be considered in the label production process. There is a whole range of premium materials better suiting the requirements of a luxury product. DTM Poly Clear Gloss TT, the new thermal transfer label substrate, can provide a label-less look by producing crystal-clear product labels with imprinted elements. DTM Gold Gloss and Silver Shiny help to underline the high quality of the product with their eye-catching appearance. But also alternatives to a plain paper material are available, such as the antique textured DTM Vintage Paper Eco or the brand-new DTM Paper Matte Nature.